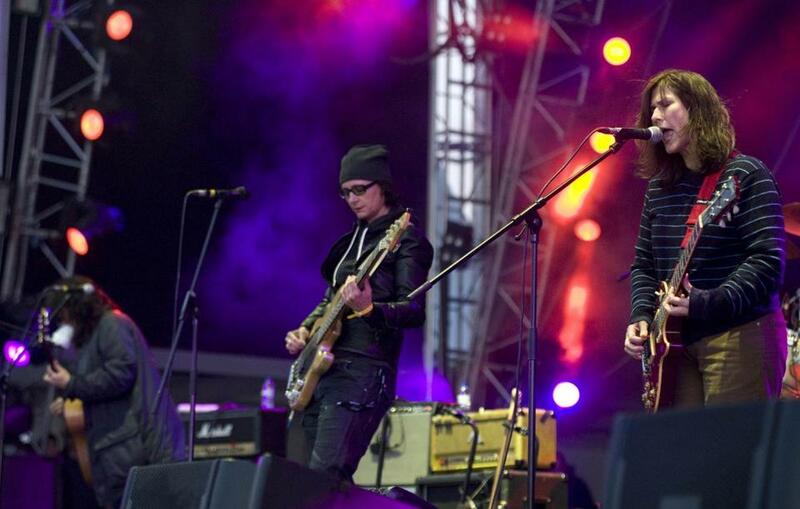 From left: Kim Deal, Josephine Wiggs, and Kelley Deal of the Breeders performing in Portugal in 2013. Veteran bands returning from a long absence have two options: Adapt to the modern musical landscape, or act like the intervening years never happened. With “All Nerve,” their first album in 10 years and the first in 25 years with the classic “Last Splash”-era lineup, the Breeders have chosen the latter. Recorded live to tape with Steve Albini (because even their studio setup is a ’90s throwback), “All Nerve” finds the Breeders still fascinated by the thin line separating beauty from creepiness, though they explore their pet themes with a purposeful ambition that belies their slacker reputation. The Breeders’ fractured indie rock gets its bizarre spark from the tension between the Deal sisters’ ethereal harmonies and their dissonant dual-guitar squall. The title track perfectly sums up their aesthetic: a pretty slow-dance number where the declarations of love are laced with menace (“I won’t stop/ I’ll run you down”). Its subversion of pop innocence would seem like blatant angling for a “Twin Peaks” cameo if Kim Deal hadn’t already been mining this territory since the Pixies. Elsewhere, there’s less subtle danger; “Nervous Mary” and “MetaGoth” are practically three-minute horror movies, while the dreamy arrangement of “Walking With the Killer” lays on the irony a bit too thick. The best lyrics on “All Nerve” come when the Breeders indulge their surrealist side, conjuring vivid images of crushed beetles on lips and black lungs in hands that lie just beyond conscious understanding. While early Breeders classics like “Pod” and “Last Splash” drew much of their charm from their shambling, casual brilliance, “All Nerve” strives for a bigger, grander sound. “Spacewoman” and “Howl at the Summit” build to downright anthemic choruses, the latter assisted by backing vocals from Courtney Barnett. The celestial guitars and heavenly harmonies of “Dawn: Making an Effort” are the biggest surprise, achieving Sigur Rós levels of gorgeous, cinematic drama. Like all Breeders albums, “All Nerve” barely passes the 30-minute mark, but it still manages to feel epic, completing an emotionally satisfying arc in half the time it would take most bands. “Good morning!” Kim Deal shouts to start the hard-charging lead single “Wait in the Car.” It’s a suitably forceful, optimistic declaration for what is, in every sense of the term, a true comeback album. The Breeders have never sounded so determined to make a great record, and with “All Nerve” their efforts have paid off.